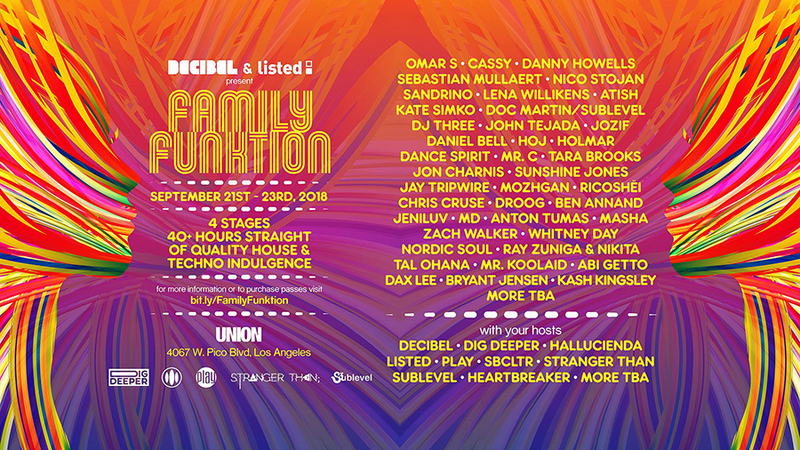 I am playing a live set in Los Angeles with 59 other amazing artists at a Listed/Decibel Festival feat of heroics called Family Funktion. Three days of all kinds of awesome. Discounted Passes to FAMILY FUNKTION are available now at http://bit.ly/FamilyFunktion. Passes are tiers will increase closer to the event and advance purchases are recommended. FAMILY FUNKTION will take place at UNION (formerly Jewel’s Catch One – see HISTORY below). Located in the heart of Los Angeles’ Mid City neighborhood, UNION is located between 5 and 15 minutes from downtown, Hollywood, Santa Monica and LAX. The address is 4067 W. Pico Blvd, Los Angeles. UNION is a two floor, eight room venue equipped with Funktion-One Sound, full lighting/video production, air conditioning, six bars, ample restrooms, ample seating and a massive outdoor smoking patio with a kitchen that will all be running the duration of the event. We’re also coordinating a marketplace for community vendors that we’ll be announcing closer to the event, so stay tuned. On-site parking is available on a first come, first serve basis (three separate lots, behind, next to and across the street from UNION). Street parking is available as well. Due to the size and scope of the event, we do recommend taking Uber of Lyft to avoid parking issue. The event will start at 7PM on Friday, September 21st and continue until Sunday afternoon/early evening depending on attendance (minimum 40 hours straight). We will be allowing in-and-out privileges, but know that there could be long re-entry lines during peak hours (10PM to 3AM). Due to the level of amenities at the venue, we are doing everything within our power to make sure all FAMILY FUNKTION attendees are comfortable, entertained and engaged; start to finish.